Mad King Obama will visit Indianapolis, Indiana on Friday to address his worshipful subjects at Ivy Tech Community College. Local patriot groups and even individuals are requested to join in. If you belong to a group in the area, please ask your organizer to support this protest. If any individual would like to help organize this event, use the contact tab above to volunteer. Sometimes we cannot find a group that will help. Individuals can help, also. Contact me at the tab above. Keep checking this website for updates. I am in San Diego. Some of you locals should help me with finding out the details of exactly where and when this talk will be. It may not ever be posted on the Internet. You might have to ask the school, which will probably be distributing tickets for the event. This article gives some of the timing for the movements of his motorcade. To avoid problems with street closures and parking you want to be at the protest site well before 12 noon. A pretty good crowd is expected. The talk will be closed to the public. There appear to be three buildings where there is enough space for the talk, the NMC, the IFC or the “Corporate College, Conference Center and Culinary Arts Center.” A local activist did a site survey and said that they appear to be preparing the “Corporate College, Conference Center and Culinary Center” to receive his royal highness. Click here for a map. Do not rule out, though, that he might speak in a different building. Watch what the police and media are doing on campus, because they will gather around the building that he will visit. Hundreds of students will line up to be security screened long before the talk begins. Protest lines should form across the street from the building in good view of many people and the media. Print a campus map here. You should be at the protest site at least 2-3 hours before he arrives, due to street closings, potential parking issues and other logistical issues. Good luck. Be there plenty early. Take photos and video for posting. Give ’em hell, Hoosiers! Let Obama be “surprised” by Indy. At the link below are some poster images that you can download and take to Staples and have them print a 2x3ft sign for about $3.50 per copy. Consider making more than one sign to share with your other co-patriots, who may come without one. Take photos and video. Let me know via the contact tab above, if you have an image or video to share. If this protest goes well, there is likely to be some mention of it on national news. Check back here at this blog next week for a report. The fact that the talk is closed to the public is already a victory, because that means they fear releasing the details to the public, which would just draw more protesters. Obama has been protested on several of his recent trips. Only malleable young minds will be allowed into the talk, whom he is trying to bribe with free tuition. He has to sneak into Indy, the most American City, like the thief that he is. His handlers fear that a very large protest may develop, which would be a huge embarrassment. That would put to lie the media propaganda that King Obama is loved by all his willing and loyal subjects. Note: Impeach Obama NOW is an informal, unstructured, volunteer movement, if you support impeachment, conviction, removal and the just punishment of Obama for his crimes, you are already a member. Polls show 100 million Americans and growing want Obama impeached! Get active. Demand it NOW! 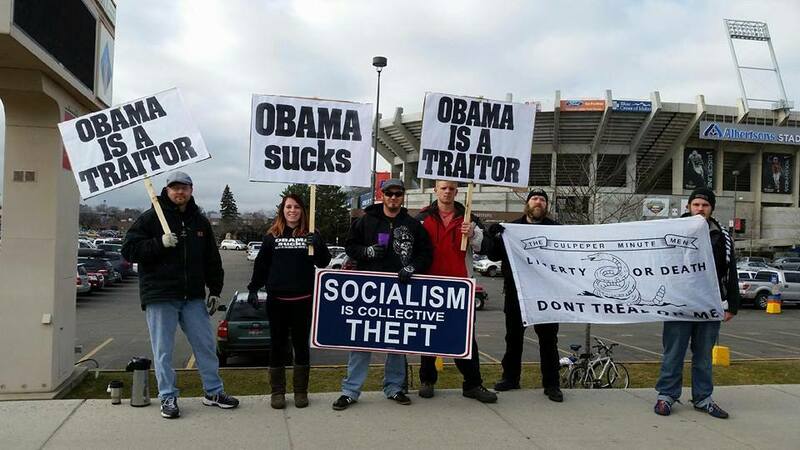 Impeach Obama Protests in Idaho and Kansas in January, 2015 (photos and video). impeach Obama NOW Protest with multiple groups in Las Vegas in November, 2014. Our goal is to have large crowds protesting him wherever he goes. This was the Impeach Obama NOW protest in Phoenix in January, 2015. Impeach Obama NOW protest at Angel Stadium in Anaheim in June, 2014. Impeach Obama NOW protest in La Jolla in May, 2014. Yes, he certainly will, if we can figure out which way the motorcade will go. It will often drive right by the protesters, within a few feet. In any case, they will know, if there is a large crowd of protesters at the site where he is speaking. That is just as good, though not as much fun for the protesters. See some of the videos at the bottom of this page to get an idea how it usually goes. I was hoping this would happen. I am not part of an actual group but am a student. I posted about wanting to protest and I received a message from a friend asking which campus he would be at as if I would tell one of his sheep. In the past, the same thing occurred when I griped about the Obamaphone stand I passed. Thanks, Nicole. Can you confirm that this is the right campus. Especially would like to have a link stating that. I can also say there are two buildings he could speak in. If I remember right, there is an auditorium on the fifth floor of the NMC building which is facing the Julia Carson Learning Center and Library directly across the parking lot. There is also an auditorium on the first floor of the IFC building which is the mostly glass building and can be spotted east of a kids’ school or daycare. That is the best I can give you as of right now. How about the corporate college, conference and culinary center? There is a lot of space over there for a talk. I don’t know about corporate college, and if the culinary center has a conference room I haven’t seen it. When the culinary center opened, we were allowed to explore the building. I had even taken pictures of the architecture. In the past, the IFC building or the NMC buildings are the ones that such massive gatherings. Okay, I will post a map and say the event could be at any of those buildings. It will be obvious where it will be, if you notice what the media and police are doing. They will be making preparations around the building he will visit a couple of hours before the talk. Protesters want to stand on the other side of the street from the building where he talks. Hopefully, the Motorcade will drive right by you. Please wave at him for me (with one finger). There has been an update on the Facebook page claiming he will speak in the afternoon. Still no news of the building though. Thanks, you will be able to confirm that by when he flies in and you will see that on the news. If he flies in Thursday night, he will probably talk in the morning. If he does not fly in Thursday, he will have to fly in Friday morning and he will talk later in the day, probably early afternoon. Protesters should be on site, at least a couple of hours before he arrives due to street closings, parking problems and other logistical issues. I recommend being there by 10 am, if he flies on Friday. If he comes in Thursday night, I would be there by 8am. It will be obvious which building he will be visiting. Hundreds of naïve students will be lined up there for a security screening and the police/media will be gathered there. Protesters should form their lines across the street from the building, especially near the media crews, so they can’t miss you.